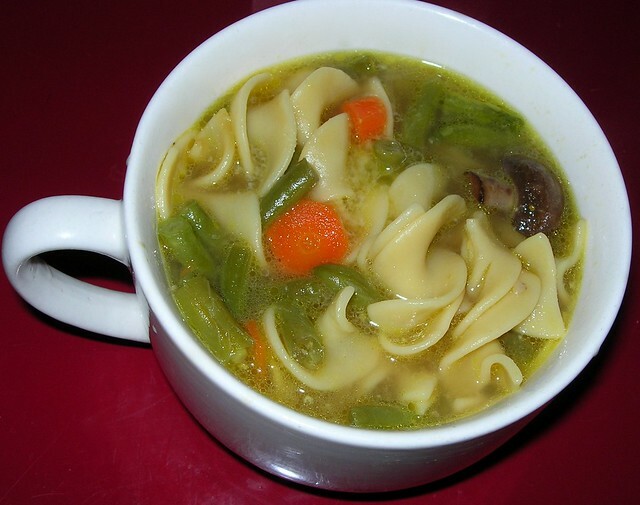 This was another hearty and flavorful soup with an emphasis on umami flavor. I made a good chicken stock by stewing a chicken in water with mirepoix (celery, carrots and onions), oregano, salt and pepper and a bay leaf for several hours, removing all the meat and vegetables and straining for a relatively clear broth. I reserved the chicken for sandwiches and salads and stored the broth in covered containers in the fridge. 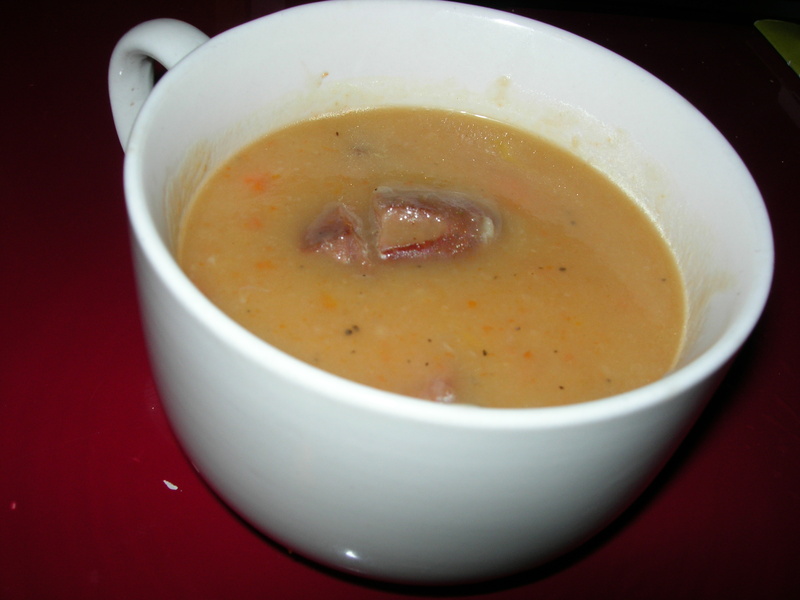 I also saved about 1 cup of the carrots, celery and onions from the mirepoix to add back into this soup. To make this soup, I turned the heat on a dry saucepan to low-medium. I sliced up 3 large mushrooms and cooked them without oil for about 5 minutes. This intensified the mushroom flavor and if you keep your heat low enough, they won’t burn or stick because they have enough moisture – moisture than you are sweating out so you get the richest mushroom flavor. I then added 2 cups of broth and brought the heat up to a simmer. I tossed about 1/2 cup or so of the mirepoix I had saved. I cleaned 3 stalks of kale, removing the ribs and slicing into small pieces. I added them to the broth and let simmer until tender. I added salt and pepper to taste. 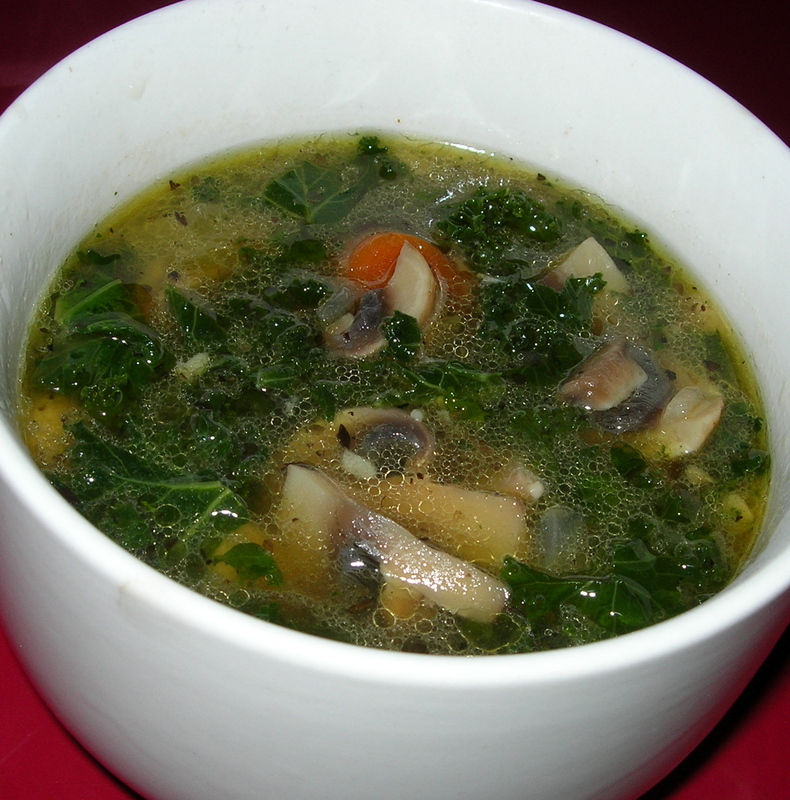 The broth was rich and flavorful and the mushrooms added a rich earthy flavor while the kale gave it a hearty feeling. This soup was pure comfort food, rich in umami flavor. The idea for this salad came to me while I was coring a fresh pineapple yesterday. The bromelain in the pineapple did such a good job of macerating the skin on my thumb it occurred to me that it might tenderize a rutabaga (swede) as well. Well, that turned out not to be true as bromelain breaks down proteins not cellulose. I produced a delicious salad, but it was not quite right. The pineapple did not break down the rutabaga enough, but the delicious zest of raw rutabaga blended so well with the sweet tang of pineapple I had to try it again. I considered parboiling, but was afraid I would lose that subtle spiciness of raw rutabaga. So, I tried salt which is often used to tenderize vegetables such as cabbage and kale. It worked perfectly. I took one rutabaga, peeled it (not just the thin colored peel but that 1/4 inch of thicker sort of rind) and diced it into small cubes. I put it in a plastic container with a lid and sprinkled about 2 tsp of salt on it. I shook it a few times and let it sit overnight to soften. I shook a few times, just whenever I happened to walk by the fridge. By morning it was tender, but still with the crunch and the delicious raw flavor. I put the rutabaga in a strainer and rinsed the salt away. Putting it back in the container, I added 1/4 cup of chopped leek greens and 2 TBSP of chopped parsley. 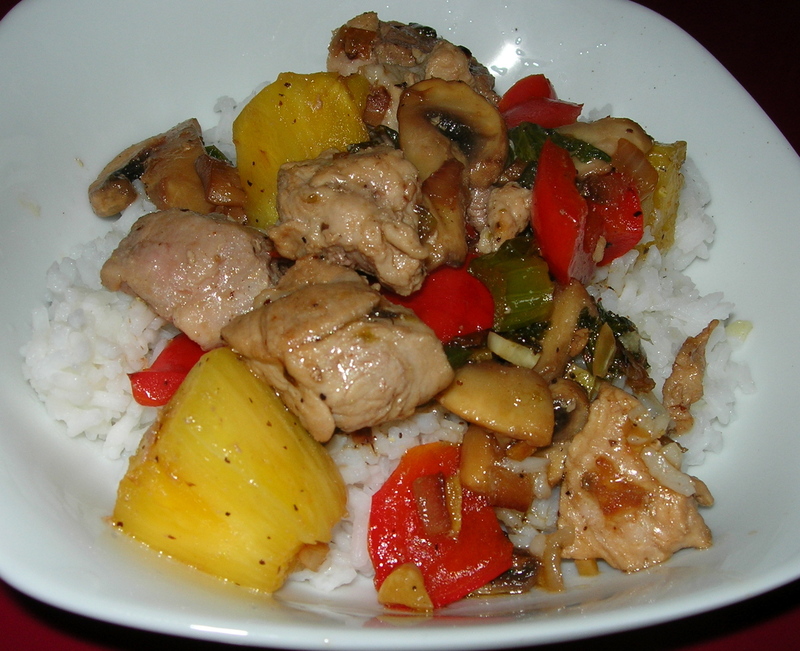 I added about 1 cup of fresh pineapple cut in small pieces. 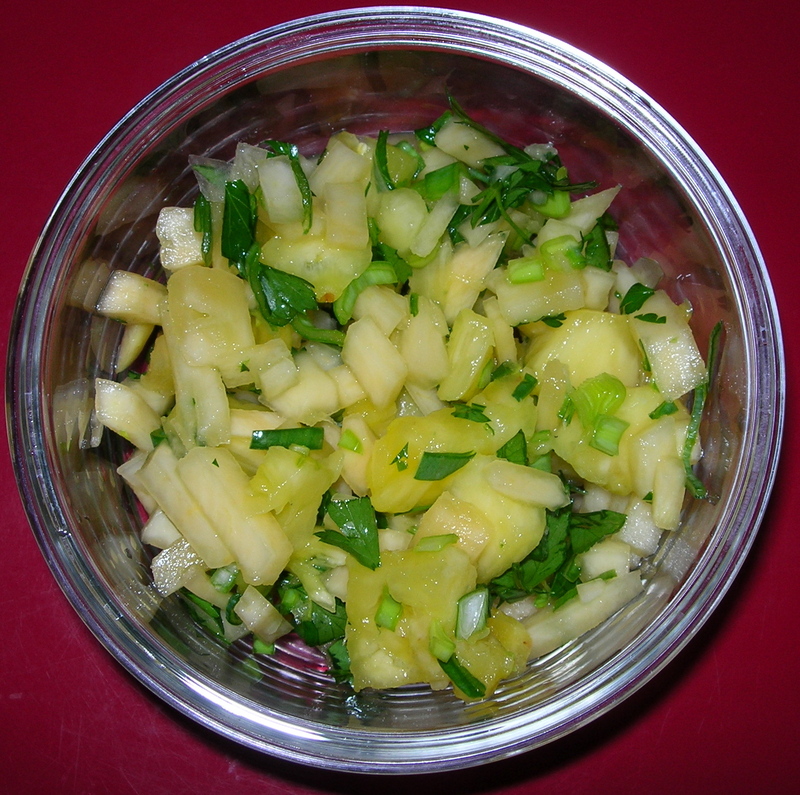 I mashed the pineapple lightly with a force to express some of the juice since that is the only dressing on this salad. I added just a touch of salt. Then I let it rest for an hour for the flavors to marry. This makes 4 servings of salad. 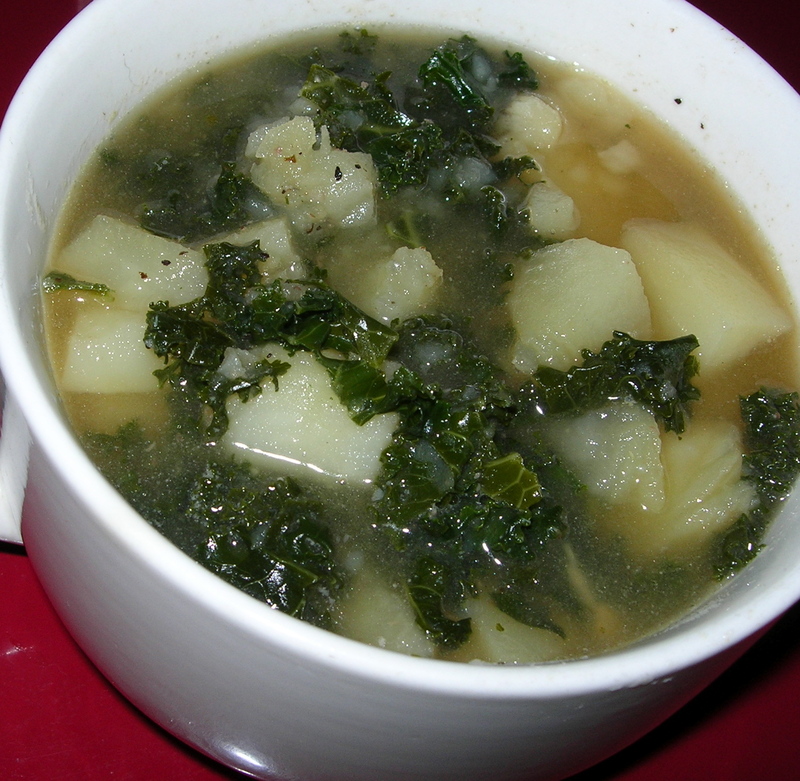 It’s got a satisfying crunchiness and the flavors are intense with the rutabaga’s heat, the sweet and tangy pineapple, the bright onions and the mellow earthiness of parsley blending into a rich, multi-layered flavor. The only downside I can see tot his salad is that it could get addicting and that would mean coring and cleaning more pineapples.